MANHATTAN BEACH, Calif. /California Newswire/ — Environmental education nonprofit Grades of Green has announced its annual awards and green fundraising evening, VERTE, will be held at the LEED Gold-certified Annenberg Community Beach House in Santa Monica, Calif. on April 27, 2012 from 6 p.m. – 10 p.m. The evening will feature singer/songwriter, Gregory Alan Isakov, sharing his lyrical hit, "3am," featured on the hit series "Brothers and Sisters." VERTE, which translates to green in many languages, was created to recognize environmental champions who have grown a local program in just two years to reach over 66,000 students in over 100 schools across 19 states, Canada and Australia. The event, now in its second year, will also raise money and awareness for Grades of Green's vision to make environmental protection second nature in young minds. Environmental advocate and former educator, Ranae DeSantis, will be honored for her unwavering support of Grades of Green and the environment. Grades of Green will also honor Wells Fargo for bringing Grades of Green's program to numerous inner-city schools and the Sanitation Districts of Los Angeles County for sponsoring a Trash Free Lunch Challenge that will result in 10,000 bags of trash being diverted from landfills annually. JD Roth, executive producer of ABC Daytime's "The Revolution," as well as long-running television series "The Biggest Loser" and "Extreme Makeover: Weight Loss Edition," will host the evening's festivities. Grades of Green students and educators will provide live demonstrations at "Eco-Stations" that highlight Grades of Green key programs, such as In-Class Composting, Trash Free Lunches, and Walk to School Wednesdays, and will explain how guests can take Grades of Green's free and easy to use templates to bring to their own schools. "The impact Grades of Green has had on our school is profound," stated Dawnyell Goolsby, principal of Warren Lane Elementary. "Since launching Grades of Green's Trash Free Lunch activity, our school has reduced the number of lunch time trash bags from eight to four. Its educational activities are also teaching our students how to compost, which will reduce the number of trash bags even more!" For more information on the event, or to purchase a ticket, go to https://gradesofgreen.ejoinme.org/?tabid=339232 . Grades of Green is an international nonprofit 501(c)3 that provides parents, students and educators with free instruction on its website. Anyone wanting to implement sustainability programs can register their school online – at no cost – to get tips and measure their success on reducing trash, emissions, harmful classroom chemicals, plus dozens of other ways to help the environment. Grades of Green has been honored with many awards, including the U.S. EPA's prestigious Environmental Award. The nonprofit is growing rapidly, with over 66,000 students enrolled across 19 states and Canada and Australia, including many low-income schools. Additionally, Grades of Green recently partnered with Republic Services to provide environmental education on recycling and composting to nearly 1,100 schools within the Los Angeles Unified School District. Grades of Green's goal is simple – to enroll thousands of schools with millions of kids- all caring for the environment and collectively making a difference. 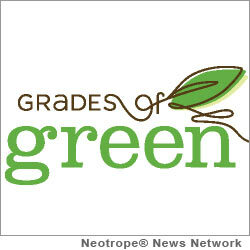 For more information, please go to http://www.gradesofgreen.org .